When you place an order with Mobineko there is a cutting questionnaire in the second step after quoting. Although it’s tempting to gloss over these details when ordering it’s super important that we understand each customer’s intent for every single production. So please do take some time to read and understand the following explanations for 3 different cutting styles! 1. LOUD cut – for dance/club or sometimes metal music, time per side is limited and the audio is cut extremely hot (generally +6dB over reference) with not much regard to distortion or audio quality; stereo effect and EQ range is also reduced to maximize loudness. Please note that this does not guarantee a super loud record if you have bad mastering and/or very long sides – consult our handy Wizard to check if your timing might be problematic. 2. normal cut + fidelity – using computer calculation and some test cuts on the unused part of a lacquer the engineer finds the maximum level where zero distortion is introduced by the cutting process; this is the option we generally prefer but many people want it to sound ‘loud like X or Y record’. Generally the masters we get these days just aren’t good enough to cut loud without distortion so if it’s important for you to have a louder record you will have to accept some loss in quality and choose the third option. 3. normal cut + loudness – somewhere between the first two options; there can be some distortion and the engineer will try to squeeze out some extra overall loudness by allowing the cutter head to naturally compress peaks. Vinyl: How many songs / how much music per side? 2014/11/09 UPDATE! We now have a fancy new online app that will tell you how your record will likely sound at any given length, and also recommend what speed to cut at. Check it out here! A common question we receive here is “How long can each side be” on a record! Well, this is a really difficult question to answer because people always want an exact mm:ss time that they can ‘fit’ onto a vinyl, but it’s not that simple. The more stuff you fit onto the vinyl, the closer the tracks have to be to each other and therefore the smaller the waveform has to be cut. Smaller waveform = quieter music and less room for bass. 7″ at 33 rpm, NOT RECOMMENDED because 33rpm 7″ sound AWFUL, but ~6mins. All times are per side. Where a range is given the shorter time will sound good while the longer time is possible but will sound bad. So a 12″ at 33rpm, 20 minutes can still sound pretty good but 28 minutes will sound bad. 7″ should really never be cut at 33rpm because the groove is moving so slowly under the needle that there is just no room for a decent sound. While some people insist on it, they usually regret it. Seriously, we can’t recommend enough just to cut down your running time and NOT make another poor sounding long 7″. How to master the audio for vinyl: Don’t overthink the mastering process or try to edit the audio too much. Also, ignore most of what you might read on forums. The best chance for a successful cut is to avoid the use of any compressors or limiters on the final mix (light compression on individual tracks before mixdown is ok). The audio should look like the ‘GOOD’ example below. The ‘BAD’ example looks like mountains with their peaks cut off. For a high-fidelity cut absolutely no distortion is accepted and the engineer will reduce cutting levels where possible instead of applying EQ or other tricks to prevent damaging the cutter head. In this case the overall volume is limited absolutely by the loudest peak in the audio, even if it’s extremely brief. When the LOUD option is selected parts of the EQ range are cut out and the audio is optimized for a club style cut with emphasis on bass over mid-high frequencies. Also distortion is considered acceptable as long as it does not risk damaging the cutter head. It is usually recommended to send totally unmastered audio direct from the desk or sequencer output, before any post mastering is done. No compression if possible. Normalize the audio (no clipped peaks or compression) and our engineer will take care of the rest in the cutting studio. If there is anything that would make the audio impossible to cut, the engineer will not do the cut and we will work it out with you. The dangers of trying to use stereo effects lower down is that when the stereo components are combined to mono they can act against each other and make parts of the mix disappear. This is called phase cancellation. You should check for phase cancellation through your whole mixing and mastering process. Even the most basic mastering consoles have mono sum as the most important feature. If you don’t have a mastering console you can pan your left and right channels to center for a similar effect. If you already finished your mix and realized you have a bunch of phase issues you can try using something like a phase inverter plugin or a stereo delay so the out of phase peaks don’t line up with each other. The easiest way to do it is nudge the tracks and/or apply filters in a sequencer while the mono sum is applied. Read this SOS article on phase for more detailed explanation. We generally prefer that clients send us the regular stereo mix and we will apply the correct mono summing on bass frequencies as appropriate. Very heavy bass (constant dance / sub woofer type bass) might have to be summed mono at 600-800hz for good results. 600-800hz is a very safe figure intended to stop mastering amateurs completely screwing up their vinyl with out of phase bass. Very generally speaking, for most amateurs keeping everything from 0-600hz mono will make a record ‘punch’ more due to the physics of how a cutting head works. We understand that this is somewhat higher than the 300-400hz some plants recommend, but in our experience an out of phase or excessive stereo bass is much more damaging than a well done stereo bass is pleasing. Sometimes we can avoid mono summing any frequencies at all (although this is rare with modern masters). Basically we use two pieces of equipment for dealing with problem bass – the ‘absolute stop’ to protect the head for stereo bass is an elliptical equalizer with anything between a 75 to 300hz crossover depending on the music and how it’s mastered. For most tracks these days both extremes are rare and usually the 150hz setting is chosen. If we mono sum the track on our console during pre-listening and find phase issues we will simply ramp up a second mono summing box. If in doubt and if you don’t have the budget to make several test cuts it’s really better to mono stuff like kick drums and drone bass instead of forcing us to mono sum a bunch of unnecessary frequencies. For more musical bass recording and cutting in stereo is certainly no problem but it does take some careful mixing, mastering and mic’ing. We would treat anything under 150hz as a total ‘no go area’ for stereo bass. 150-300hz be very careful – absolutely make sure your stereo channels are in phase. Beyond that you should be ok unless you go crazy. When we really want some psychedelic stereo effects or hard panning a simple trick we use is to double up the tracks in a sequencer, apply a curved low pass EQ to the first group panned mono, then apply some light compression/volume boost/separate EQ curve and high pass EQ to the second stereo group. With separate fine grained control over the mono and stereo parts you can really make a mix pop on vinyl. It’s impossible to get a 1:1 stereo separation on vinyl because the cutting is done with 2 coils arranged in a V shape. Apart from the fact that there will always be some bleed between channels the absolute limit is always in the vertical aspect of the groove. When stereo separation exceeds a certain level certain EQ ranges have to be panned to center to avoid the needle physically jumping out of the groove. That’s a physical limit of vinyl. 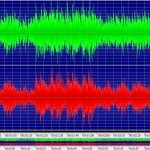 Final files should be .WAV in 44.1kHz or 48khz/24bit sampling.